Just call me the crazy cat lady! So last weekend I did something that even the most die-hard of cat lovers would think is slightly over the top! 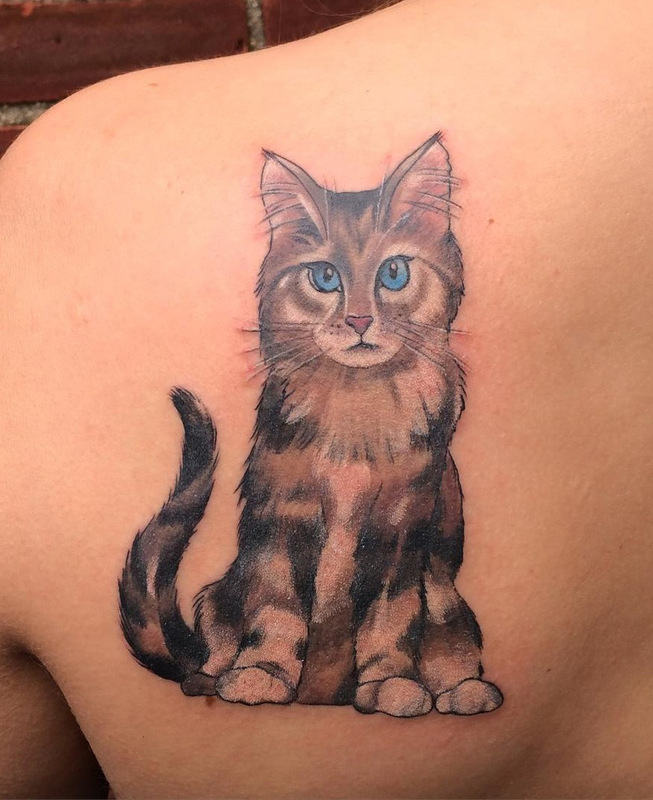 I got a tattoo on my back of my beloved puss Spooner! 7 hours spent in pain to be left with a forever etching of my furry pal! And I have to say, the ink is nearly as beautiful as the real cat (and much less effort to keep in check). Some people have asked me why? What makes me love this furry feline creature so much that I would have her immortalised on my own skin? I have sat and thought about it, wondered what makes her so important to me. I have had other cats, in fact we actually have 2 living with us at the moment and whilst I love Sookie (or current cat) and have loved the others that have been a part of our life, there really is something truly special about Spooner. She is sweet hearted and kind; which I know sounds silly when you think about a cat. But she truly is. Anyone who is ill in the household, she is there, sat with them, a paw on their leg; just to let them know that she is there! Perhaps strangely, this kindness even extends to other animals. Unlike the majority of kitties, Spooner was never born to be a hunter. She simply cannot bring herself to injure another living creature. I remember once our hamster escaped whilst we were out at work. Rather than hunt it, she sat about 2 feet away from it, waiting for us to get home. When she heard the key go in the door she bounded over to us, meowing loudly and running towards the kitchen. Following her, we discovered the Hamster nibbling away on some fluff, perfectly safe and perfectly reachable to her if she wanted to. Once she knew she had finished her quest and the hamster was safely in his cage, she jumped up on the sofa and fell asleep! Spooner is 10 now and whilst the vet has said she is in the best of health for her age, there is always a niggling doubt in the back of our minds that this isn’t going to be forever. We can safely say that Spooner is as much a part of our family as we are and without her, our lives would never be the same! Are you a crazy cat lady? If so how committed are you to the crazy cat lady cause? Time to show your true colours and get some ink! This entry was posted in Cats and tagged cats, ink, tattoo.